The protesters of OCCUPY London have been causing quite a stir since they set up camp in Paternoster Square, outside St. Paul's cathedral a few weeks ago. I must say that as a fashion journalist, I didn't really think there would be anything to report on, style wise, from the fracas. After all, from what I can gather, these people are broadly anti-capitalist, given that they claim our 'current system is undemocratic and unjust' and that would suggest to me that any kind of fashion story would involve the sandals and dreadlocks to be spotted out on the Square. That's just me stereotyping though. So, I was somewhat surprised to open Monday's Evening Standard and find one of these ardent supporters of OCCUPY, Lucy McKay (aka Lucy Brisbane, apparently) modelling the latest peace sign leggings from Topshop topped with a peace sign sweater. The headline reads 'Radical Chic' and discusses all the coolest protest-appropriate fashion options.Now, if you are protesting about the inequalities which the current system operates under then I would imagine that one of your first priorities would be to not wear Topshop, given all the tax avoidance accusations regularly pointed at Phillip Green, who is surely the ultimate capitalist? Amongst the comments beneath the article online, one person writes 'Lucy, you are wearing Topshop. Where are your morals?'. In a weak retaliation to her critics, Lucy says 'It's a fluffy fashion piece'. Is she trying to say that we can separate our fashion preferences from our political beliefs? That's an easy thing to do, but not something you might expect from a member of such a stalwart group of a few hundred who claim to be representing the best interests of 99% of us. It may have been somewhat more understandable if Lucy had modelled some fabulous ethical fashion, made in conditions which adhere to the changes she is campaigning for. By calling it 'fluffy fashion' Lucy hugely undermines her raison d'etre at OCCUPY London. These days the clothes we choose to wear represent a belief system. So, in the same breath as protesting against capitalism, she is personally encouraging it (and financing it) with her choice of clothes. Someone bring her a sack. 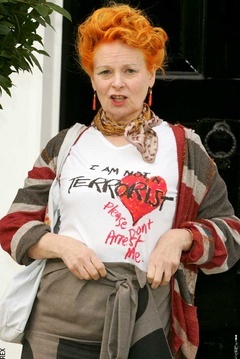 After this, I noticed that Dame Vivienne Westwood had visited the St Paul's camp to show her support. I do admire Dame Vivienne, and a lot of what she says is certainly thought provoking. But I couldn't fail to notice that she'd just got off a plane from China where she had been to launch her new shops over there. Basically, one day she was doing what every savvy business owner is doing right now, ensuring they are tapping into the vast potential of a Chinese customer base, thus growing their own business and increasing their own revenues; the next she is showing solidarity with the very people who are campaigning for a change to that very system. I don't proclaim to be any sort of expert on any of these matters; I am very interested in politics and am concerned about our current economic woes which often seem incomprehensibly profound and far-reaching. So I have certain sympathies with what OCCUPY seems to stand for, although nobody seems to be completely clear on exactly what that is. I am also seduced by fashion on a daily basis but know that there is a lot wrong with where we get our clothes from. Living an OCCUPY version of life is hard to envisage, but I'm pretty sure it wouldn't involve wearing Topshop or big business expansions. Lucy and Dame Vivienne are doing the cause they are allegedly supporting no favours whatsoever.